I'm getting a little panicky. The perfect suits everything, wearable with camel, not too scary, fresh new coat has not appeared. Really I want something to go with longer skirts so maybe I should start looking at jackets? That way it will be cheaper and wearable right away. I went into town on Thursday (after work, hence the jeans) to run some errands and check out coats. I walked in one side of Topshop and walked straight out the other because I wouldn't get a coat from there as I don't think the quality is great for the price and I'd worry someone else would probably have it. I attend lectures with about 150 girls and guaranteed they all shop in Topshop! I find things from there stand out so much that they're harder to camouflage into your own style. I checked out H&M and saw that cape I posted below, but as someone commented, it is really orange in real life and very thin. I tried on one of the androgynous over-sized camel coats but they don't suit me at all! I made a beeline for River Island because of my discount and saw this coat I'd spotted online. For some reason it's not there anymore though and I can't imagine it sold out! There was almost one of every size in store. I really love this coat as it has a sort of Icelandic feel which reminds me of Scandinavia and it has the best flared skirt but is still short. Also I LOVE pom poms!! But if the whole point was getting a coat to wear over 50's style high waisted thick skirts and maxi dresses, this wouldn't be a good investment and I'd be back to square one! Also it's a little bit too different and thus attention grabbing so I wouldn't be totally comfortable wearing this every day. There's some styles like child's dresses and 70's wear and sailor stuff that feels so natural that I don't think twice about wearing them at all, but if it were a day when I just wanted to go about my business quickly or didn't feel great, I wouldn't pick out this coat for that day. The same thing is with my purple Reiss coat but because that's such amazing quality, I try to remind myself it's just the colour that some days makes it feel a bit too noticeable, and a colour is a colour, no big deal! I think I'd get that coat if it wasn't totally different to what I'm looking for. I had an incredible coat from Zara a few years ago and wore it for two winters, and would wear it again! It's 60's A-line with a peter pan collar and cropped sleeves, in a subtle black brocade print which has now seen better days. The lining is ripped to shreds! 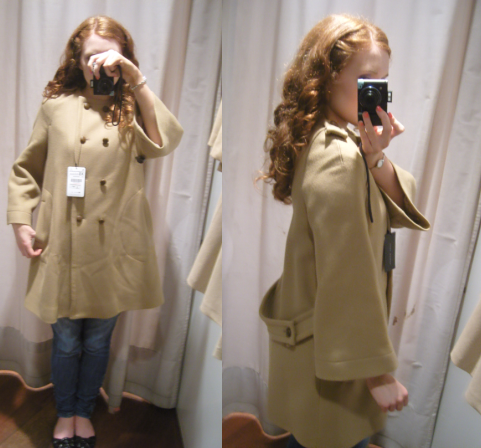 Back then in about 2006 it was only £89 but I tried on this creased, plain coat that day in Zara and it was £99!? 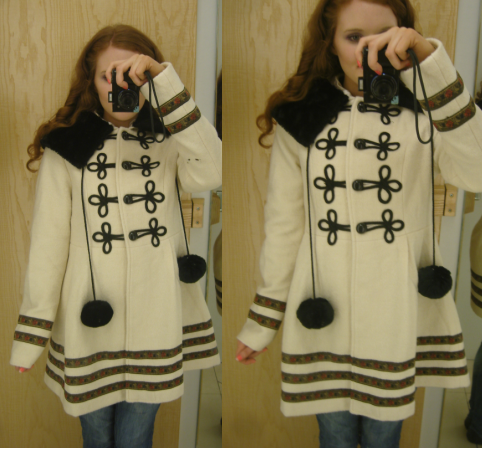 I really liked the sleeves and the huge belt at the back but the creases made it seem such bad quality for the price. I also realised I won't be getting a camel coloured coat. The main reason is because I think it's too many of the same tones with my hair already being an orangey/tan colour! In some ways it could work but I'd rather be able to buy a few camel coloured things, and I already have a camel coloured bag. Ah the search continues, not cool! Maybe I'll start scouting jackets. Happy Bank Holiday! I'm not working this weekend and don't really know what to do with myself today as I'm trying to save money for my first month's rent in September and my little holiday to Newquay soon. Thank you for the tips!! I'm going to note them down and take them along. I can't help laughing when I think about our new house in Manchester as we had the funniest day looking!! As we basically had to get one that day or else we'd all have to come all the way back up and we didn't have time/funds, we booked in to see loads of houses and they were almost all a disaster! Total dives with leaking fridges and crazy wallpaper and a million miles from a bus stop. We had the giggles even before we went to the first house because the landlord was called Fong Wong and we were like yea lets live at Fong Wong's! Then we found the house a million miles later and it was joined to what looked like a squat and the landlord had crazy teeth and a denim fur jacket; it didn't look good! 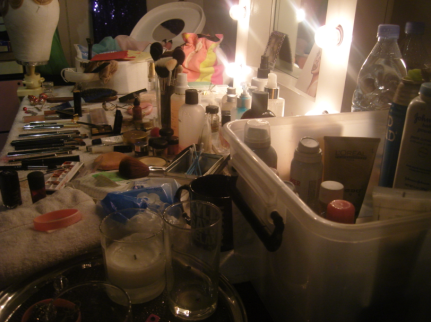 We went into the shabby hall and the guy was like 'three girls one room yes?' and we said huh?? we thought there were three rooms? And he said 'ah no there are seven! you all in one room!'. We were like whaaaat?! This guy thinks we'd all live in one room?! He was saying 'amazing big room!' and we were like haha we don't think so! I think I've said before I've got the little room in the house we finally found as my friend on the same floor had a small room last year, but house hunting last minute is definitely the thing to do because we're paying almost a third less of what we paid last year and didn't have to pay summer rent! Are any of you guys coming to Manchester? I'll see you at fresher's week! Anyway I'm majorly going off on a tangent because I haven't got a plan today apart from watch Katy Perry on X Factor. I LOVE Katy Perry!!! Last night I actually went out which I don't do much at home as my friends are all off at their Unis and my other group of home friends have their baby so can't go out that much. We all went out last night though (to Snobs if you know it so my shoes are so dirty!!) and I was going to take a picture but there's not really anywhere to take them against in my room here. When I go back to Uni I'll find a place and keep my tripod there so snaps are really quick. Instead I made a little video because I love watching OOTD (outfit of the day) videos on YouTube. I think videos get more attacks because when you show what you're actually wearing at the time, it's like you're saying it's something to look at, and if some people don't like it, they'll want to take you off your high horse. Pictures seem a lot less offensive to people? I don't know, take it with a pinch of salt that I can always think of ways to improve my outfits and not everyone will gain something from seeing them! I also wish my hair was longer so it would balance out a bit more as I love big, 60's hair. Ever since that stupid Toni and Guy cut I haven't been able to grow it extra long like the last time I was at Uni! Also woah my dress looks short in this video, it's because I was just sitting down and I do wear it longer. That's the thing about videos, you can't pick a different video like you can with pictures. Also the editing was all crazy and this was the best version so sorry about the ending, I said thanks for watching! I'm going to spend the rest of the day going through all the runway shows I haven't seen and then I can make some Autumn fashion posts! I'm still coat hunting and feeling the pressure despite it only being August as I went to my fallback coat shop Zara on Thursday and they've put the prices up so high! I've said recently how I've fallen into a clothes rut and that I really need to buy new things as my wardrobe favourites are going into old age! But in some ways now I know the shops and fits that suit me best and the items I'll get the most wear out of. This makes it hard to shop as I scrutinise everything against many standards (hence why I've got LOADS of makeup now instead!) and only buy things I have nothing similar too. That's why my wardrobe is so random! I'm not sure how many of you readers here watch my YouTube videos but would you like to see a wardrobe tour some time? I've removed some crazy offenders ready for the bank holiday car-boots so it's not too obscure, and I've put a few things on eBay here. I put a Buy It Now on all items and there's not many left, half sold in the first night! If you're eBaying, just add BINs so you don't have to wait around for a week for people to change their mind about bidding. One positive side of being a critical shopper is for going out clothes. When I say 'going out', I mean to a club! I just about never go out for drinks (unless before the club) or dinners or anything like that; when I'm at Uni I'll go to a student club about once a week and at home I'll go out maybe once a month. So going out clothes are really in a league of their own because I don't dress at night how I would dress in the day at all. If I'm out at night, finding cute boys is high on the agenda and it's also a chance to wear a tonne of makeup and have big hair. I've probably got about fifteen going out dresses (and one playsuit!) but I alternate about eight. I still have things on rotation from freshers! 50% of my favourites are American Apparel (all u-neck) and 50% are Motel (have you seen my sidebar discount code yet? ), and all the others I like but have found fault in. Maybe they're too tight or too short. I don't mind wearing sort of the same thing at night because I know what I feel best in and what I'll gravitate towards. If I feel like I need a new addition to the selection, I go to AA or Motel. And I've recently confirmed that my go-to place for heels is Miss Selfridge. Miss Selfridge have great girly things and out of Arcadia you'd go there for something a bit more feminine or Gossip Girl style. I had a pair of navy triple strap Mary Janes from there in freshers year (do you long time readers remember me sticking Rodarte inspired spikes on them?) and they were actually quite high despite the pics, in fact I might root around my old things to see if I still have them! 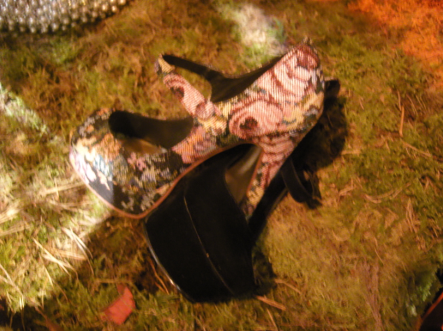 Well those shoes lasted so long and they were so reasonably priced. I only own one pair of shoes in each style (boots, flats, sandals, etc) because most of the time shoes are so expensive! Socks from Gina Tricot in Sweden, tights from H&M. 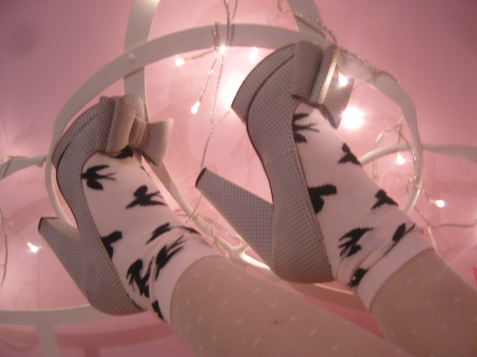 Lets hope they come out just as my grey Pollys (as I'm now going to call them) bite the dust, as platform Mary Janes are another of my shoe idols. I did know that the grey would get scuffed up and was going to invest in some shoe cleaner, but I've rubbed at most marks caused by dancing with a baby wipe and they're not obvious when worn. I have to go into town tomorrow to claim my tax back since I started working, and will pop in store to have another look at the platforms in other colours. I suspect I may drool on them and be made to buy them due to the damage, but that is my secret master plan muhaha! 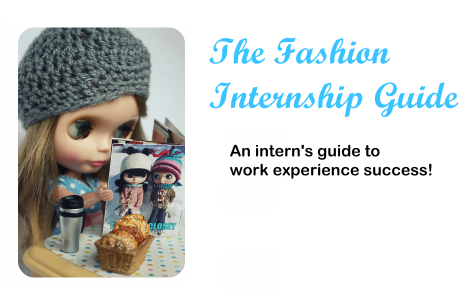 I have now wrote a book on fashion interning, containing 75 pages of my top tips and insider advice for aspiring fashion interns! As your manicured helping hand, The Fashion Internship Guide offers all the advice on how you can gain valuable experience to build your CV, cultivate your USP, create a fantastic application, and excel in an interview; propelling yourself towards the working woman or man you wish to be. Last time I talked about how to get an internship and today I'll give the tips I found are useful to use at an interview. These tips might be applicable to any kind of interview as I believe the more interviews you've had, the better you perform in them, and I've had many! I've had part time jobs working in high street stores and recently went to two before I had the interview for were I'm at now and it was the best interview I've ever had and my manager said in the feedback that I was the perfect interview candidate. But I obviously didn't get the position at the interviews before that and I'll talk about it further on. If you have any interview tips, please comment them for others to see! You have an interview? That's great! It must have been the result of applying for all the opportunities you find, checking websites daily, thinking outside the box, and making sure your CV represents the great skills you have. I was only interviewed for one of my internship placements but have lots of interview experience so there were a few things I did before I went, and a few things I could have done in hindsight. If you owned a company, you'd want employees not only to be familiar with you, but also love your message and purpose. A company does not have the time to teach you how to do tasks and teach you about the tasks they actually do in the first place, you should already know! Research what kind of role your company has in the industry, its clients, its history, the key names of employees, and any recent happenings. At the high street store I work at now, I know they do work with fashion graduates so I mentioned in my interview how cool it was that they support textile students like me. Knowledge is power! You cannot go into the interview knowing too much. If you are travelling there, prepare some key points in a notebook to look over before you go. Reserve time to plan in advance to plan your journey, thoughts and outfit. My interview for one of my placements was in London and so I made sure to get there early to find the place, and then went and had a drink and a snack while waiting. The employer may have a copy of your CV at the interview or will have gone over it before seeing you, so make sure you refresh yourself on the points you made and all the experiences you have mentioned. If they ask you about a job you did three years ago, you'll be ready to talk about it. If you're travelling on a train/tube/bus and it's a fashion internship, take a magazine to read. 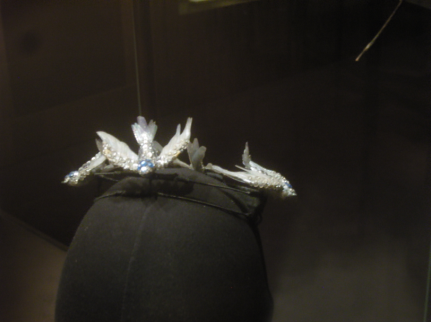 You'll have fashion on the brain and will be up to date on any recent happenings and future trends. Of course if it's a magazine or publication that's you're interviewing at, read their latest issue. You should always be true to yourself in whatever you do, but align some tips with your own style. If your clothes can dictate how you feel and act on the day, wear something fresh, new or loved so you feel current, ready and comfortable in yourself and the fact that you look your best. If you do plan on buying something new, don't do a last minute dash! Base your look on what you'd wear if you did work at the company so you really project yourself into the role. Remember details and wear interesting accessories and a lovely bag, it will show you'll take care of the small details at work too! If you have an interview at a very fashion forward place or somewhere that is a bit intimidating, wear a few pieces that you love and really represent your style, and maybe something new to boost it into current fashion trends. Remember small details like nail polish or earrings. 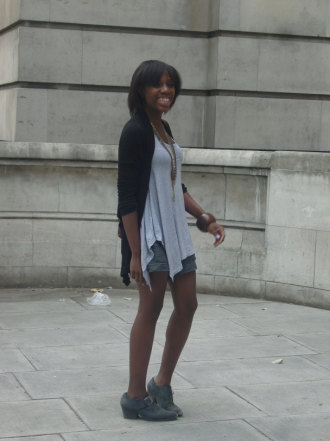 For my interview at the fashion PR agency, I had no idea what to wear as I didn't know what a PR agency would be like! I think I wore velvet leggings and a mini H&M tutu skirt (a subtle one, not a poofy underskirt type! ), and the lace H&M biker style jacket. One of the girls that worked there asked where it was from so that was lucky! I also wore my Weekday leopard wedges as I thought wearing heels would look a bit more fashionable and mature, but after walking up two flights of stairs I was a bit out of breath! If you do, wear comfy heels and put them on just before you enter the building. No point wearing them for the whole journey! Some fab inspiration is the What Team Elle Wears To Work blog that shows what the actual Elle staff wear to work each Monday. If I were them, I would totally wear my best outfits on that day haha! If you check out the site, you can see it's not all about smart designer items and looking classy or like you're wearing designer labels. It's not fashion week every day, but I think the commonalities between the staffers are that they all wear good quality things and don't over accessorize. 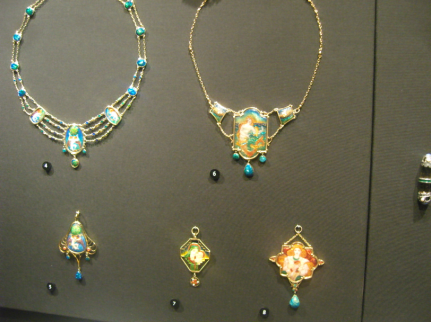 A lot of the jewellery they do wear are unique or special pieces often from jewellers or by expensive brands, and there's a lot of denim and trousers. Remember, interns spend a lot of time travelling between desks, carrying and packing things, and possibly setting things out or sitting on the floor. Don't wear delicate tights! If you look like you're not used to hard work in your interview by wearing fragile looking things, you might be less likely to get the job. Wear something that you could wear to your first day so you're ready to get stuck right in. If you only dress to impress in the interview, they will have no idea what you wear on a normal basis, and as a member of the team you are part of the face of their company. I'd also wear a nice perfume (not too much!) so you are literally a breath of fresh air! What should I take to an interview? One thing you don't want is an overflowing, heavy bag!! Keep things to a minimum and along with your other daily stuff, take a little notebook and pen or your diary just encase you need to write down dates or take down any info. Don't forget an umbrella just encase, and take a cardigan or jacket so you don't turn up shivering if there's a temperature drop! You might want to keep a little mirror in your bag so you can double check your makeup is fine and take some water so you're ready to chat away. Don't be afraid to take a sip during your interview! What will happen in my interview? Don't be scared! The more interviews you have, the more comfortable you'll feel in the future so don't put too much pressure on yourself. If the job is right for you and is meant to be, you'll have a great chance. If not, put it down to experience. The two jobs I interviewed for recently were definitely not for me but each style of interview was different so it was great experience. The first was on a makeup counter where I realised I love makeup but could not put it on other people and persuade them to buy it. But during the one to one chat I was asked questions which I could keep in mind and could also observe what I thought was great about other candidates. It's important to project yourself as much as possible but be open to learning. The other interview didn't actually ask us any questions but was a group discussion on some questions in the application form. One was that if a customer was trying on an item you thought was ugly and asked for another size, what should you do. I suggested that everyone has their own style and just because I thought something was ugly, it wouldn't mean the customer did. Maybe they loved it. But that turned out to be the wrong answer, oh well! I don't shop in the store anyway but it's great to look back on and think of ways you could have improved your time, and it makes interviews a lot less stressful next time. One of the most important things I observed and learned at the PR agency was that it doesn't cost anything to be nice, so be extra nice. Unless it's to the point of ridiculousness or disturbance, there's nothing bad about a lovely person who is cheerful and polite. When someone says hi, how are you?, ask them back how they are. Don't be shy! Be a pleasure to interview by smiling, and take a few deep breaths if you're nervous. The interviewer is a person too and really you're only having a chat. Pretend your family or friends are watching and remember how you portray yourself naturally when they're around. At the end of most interviews they ask if you have any questions so try to go with one in mind. Make it something with a fairly short answer but use it to show you're interested in the company. Sometimes when you're in the situation and really want to please, you'll say yes to everything, so don't promise you can work for more time than you can and make sure the offer satisfies what was stated in the job description. If you haven't seen The Hills or The City, some of the girls on the show worked at a PR agency owned by Kelly Cutrone (I just read her book! ), and she had her own series called Kell on Earth set in her New York offices. She's know for being upfront but some of her employees interviewed some interns and just after they'd hired one, they went on Twitter and found she'd tweeted before and when she was just outside the office door all about what the place was like and how she got the job and was going to be on TV. They rang her and declined their offer! A job should not be gossip. My biggest pet peeve is people showing off and I cringe when people flash their life around, especially on Facebook. There's no need for anyone you don't really know to hear about your accomplishments so don't let it go to your head, find better thrills in life! Be respectful and have your internship as a personal gain rather than a medal. What will I be asked in my interview? You're usually asked what you know about a company and what you know about the role you're wanting to take. Look both up on the internet so you know what sort of thing they expect and always relate all your points back to the skills you have. I'll talk about what I actually did at my internships next time! I was asked what magazines I read and celebrity style I liked I think, as it related to PR, and I listed my favourites but also ones I thought were relevant, and I even said I didn't read UK Vogue because I didn't think I was the target audience (what a snoozefest!). It showed I was aware of some magazines even if I didn't read them, and was my true opinion too. Never lie or else you might be called up on it later! If you don't know the answer to a question or can't think of anything to say, express how you're full of enthusiasm and it's one of the things you look forward to learning. Really project yourself into the role. Favourite questions to ask often start with 'Can you describe a time when...' so that's why it's important to refresh your mind on all the work experience and interests you have. If there's something you don't think you can show in an interview setting, find a way to mention it. For example, I don't think I look like I'm that great at hauling around clothes or pulling two hundred lookbooks to the post office so actually say most of the time that I'm stronger than I look and like to get stuck in! Make sure you talk about your qualities as a few may be missed if some questions aren't covered. I'm off on my jollies in just over two weeks eeee! Well I'm going to Newquay with some chums, which include my best friend of six years and her partner and toddler and two more guys friends and possibly a little brother thrown in there too! So it's going to be lots of PG fun and hopefully lots of beach times! Do any of you guys live in Newquay? I'm going to do some research! Really I chose internships over any kind of holiday abroad this year and I visited my friend in Paris, so there are no foreign shores for me. Not that I can get on another plane for a loooong time, I've been on so many this year!!! Even if I had the time and dollars, I'm really looking forward to rainbow sticks of rock and waterparks and maybe some days on the beach if the weather is good- pleeeease be good!!! We went to St. Ives for two days last year and our group along with a baby did get some raised eyebrows but it's the perfect excuse to go on child-friendly days out. I'm taking it as an excuse to go all summery again, even if the sunshine has deserted us over here. 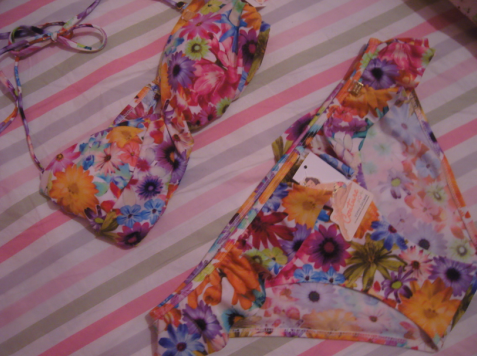 I couldn't resist getting a new bikini as I'm trying to stop wearing all the things I've had for ages and take the chance to buy some new things. I started a wardrobe clear out today and I'll keep you posted as I realised it's fine to have things that are years old but still in good condition, but in order to keep them exciting, you have to pair them with fresh things! If I don't invest in some new items soon, I have the danger of going to lectures this year in outfits that I was wearing to lectures in Manchester over a year ago! I've been eyeing up this bikini in River Island for ages as it was the last one in store and as payday is tomorrow, I treated myself. 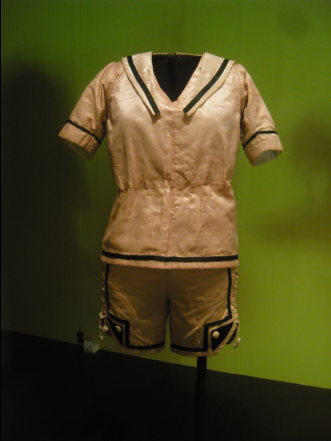 Now I can appreciate going on holiday thinking 'yay I can't wait to hit the pool in my new stuff!' rather than 'right I've packed my bikinis...'. I think we have set categories in our mind like 'cardigan', 'plain white tee' and 'shorts', and once we fulfil them it's like there is no need to ever replace them. But I might create a rule of knowing something is getting old when you just think of it as 'I'll need a bikini- I have one already from two years ago' rather than 'I have a fabulous, cute bikini I'll be excited to put on, hell yeah'. If it's not the latter, it might be time to sell, donate or recycle. Cradle to cradle, people! 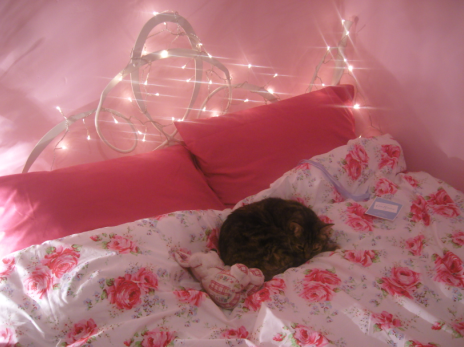 Also I found this amazing site by typing 'make pictures cute' into google! 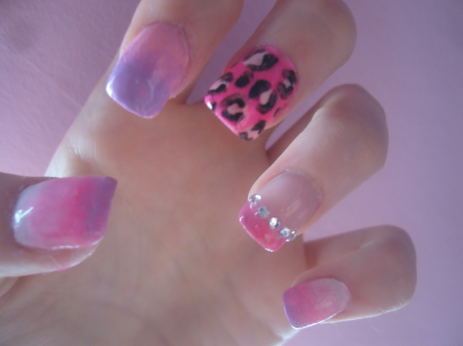 These are my nails at the moment although they're not that neat as my gel nails have grown out quite far. 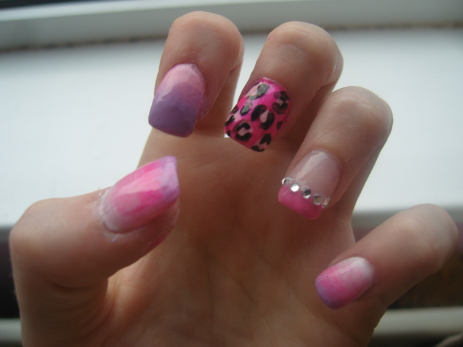 I might leave them off for a while as they're quite expensive to keep up, I'll see how natural nails go. Someone asked if I was thinking about what to wear in Autumn and it's just about all I'm thinking about! Last year I couldn't buy from the UK high street and had to gear my funds towards travelling, but this year I'm back at Uni for the final time and am really, really looking forward to getting some new stuff! I didn't buy a lot of anything last year and realised that most of the things I wear are years old. I can't get my head around getting rid of old purchases even if they're all miss-matched and worn many times. I've been trying to be as sustainable as possible and haven't bought any clothes for ages, but working in a shop and watching haul videos of people often buying new things is making me reconsider. I never actually 'shop' in the sense that you wander round looking at things that catch your eye and come home with random buys. I always think things through meticulously and buy things if I need them. I only have one pair of shoes to go out at night in and I'll wear them until they fall apart. Why would you need another pair? On a student budget, I don't have the luxury of being able to buy a range of things to choose from, I have to prioritise essentials, but the truth is that there's nothing fresh about my wardrobe. I'm going to do an overhaul as the bank holiday in two weeks means there will be loads of carboot sales, and my sister and I are planning on clearing out all the things we leave at home when we go to Uni. Within reason, I'm going to make a list of new things that I need to invest in, and I've been circling things in the September issues and saving runway images with ideas. I'll document all that on here as I haven't finished yet, but for the past few weeks I've been thinking about one cape. I have three coats; one is the amazing purple Reiss swing coat I got two years ago, one is the military, ruffle Gina Tricot coat I got before Christmas and wore to London Fashion Week, and one is a black New Look toggle coat I picked up to wear all the time in Sweden. They're all swing or dress shapes so aren't right for maxi or calf length skirts. This is where the cape comes in! I'll probably take all my coats to Uni and I love buying a new one almost every year because you get so much wear out of a great coat. I wore my Reiss one in my second year from about October to March, that's so many times! All the things in my wardrobe that I've only worn once or twice could equal the price of it. 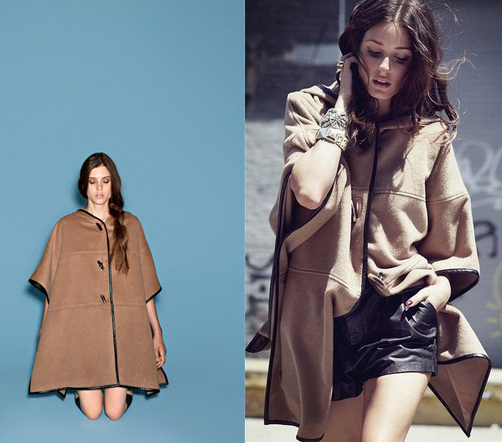 I was thinking of a camel coat ever since the fashion weeks but don't think I'd do the androgynous shapes justice, and then I saw the Olivia Palermo shoot in ASOS Magazine featuring a great cape. It's featured twice in the issue and both times it looks different. Even on the buying page on the site, it's featured on two models and it doesn't quite look the same. There's even a video of the shoot and the standard ASOS item video and they still look different! 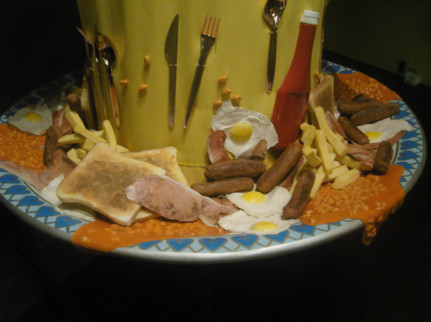 I haven't ordered it to try myself because 1) Even if it's amazing, isn't it a bit early? Would I still love it in two months when I first get to wear it? and 2) Will something better come out on the high street? My thoughts were confirmed when I spotted this cape in a H&M Autumn preview post on Nitrolicious, which is great for checking out new monthly and seasonal H&M stock but a lot of the rest is American brands. 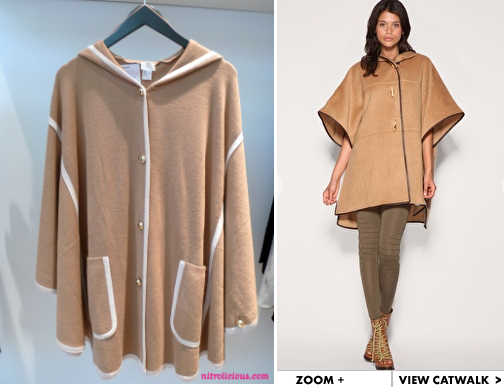 I'm guessing this cape would be more like £50 to ASOS's £80, but I wish the piping colour swapped so it had brown leather like the ASOS cape! Both need to be tried on so I'm tentatively watching ASOS as no sizes are sold out yet, and I might try to find out the release date of the H&M cape, or at least keep tabs on the store! I've actually got to zero on my google reader for the first time since April (woooohooooooooo!!!) so I'm getting on with the rest of the Internship Guide and also have someone for you to soon meet! Have you got any premature Autumn buys in mind? Bloggers Galore - Part Two! Funnily enough, comments came up at the meet up last week that I wrote about yesterday! It might seem like you'd go through every detail of blogging with other actual bloggers but I always walk away thinking of loads of things I should have brought up and the conversation topics tend to be very wide, not just tech stuff! Our opinions differed from being quite happy to blog without comments to totally loving them. It's unfortunate that the bigger the blog, the more trolls there are, and nowadays I have to delete so many comments that are random things from fake designer bag or trainer sellers. 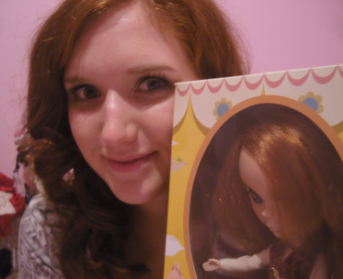 We also talked about bloggers we love and would love to meet (I still haven't met Susie Bubble!!) and etiquette of dealing with (or 99% of the time turning down) companies who want to use your blog for promotion. If you're a blogger, please remember that if you're accepting freebies, consider all the environmental impact that has gone into the manufacture of the item, from crop growing, manufacturing, chemical treatments, labour, and transport, for something that you wouldn't have purchased in the first place. Consider making it a policy to see if the brand is aware of their responsibility to the environment! If you wouldn't have spent your own cash on it in the first place, will you get the use out of the item to justify its creation? Just some food for thought! Kylie and Kristabel in action! First though we took some snaps! Here was where a big divide showed because we stood around a bit sheepishly at first but Kylie had no fear and was jumping on benches and posing in a red phone box, she is what old Tyra would call fierceeee!! If you know her blog, you'll know the girl can strike a pose! Then it was Rebecca's turn and I swear it was like stepping into one of her blog posts because she is so photogenic and was pulling her perfect signature poses that I've seen so many times on her blog! 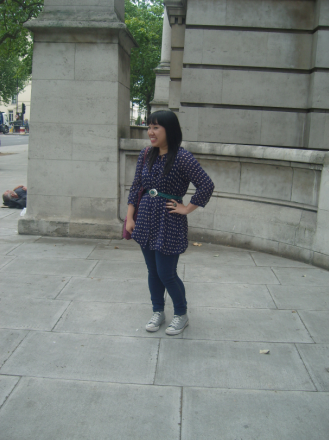 Us Brits were a little more hesitant, myself because I am not photogenic and have no idea how to pull a good pose! When I stood in front of the camera I couldn't stop grinning like a bit of a loon because it was so funny! If you check out the posts from the other girls they have group shots and some funny examples of typical blogger poses, haha! See here, here, here and here. 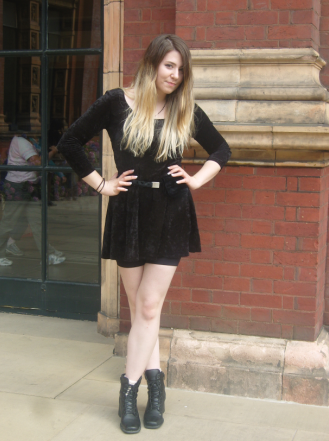 So onto the V&A, where we all abused the no photos rule! Whenever I read magazines, I fold over the corners of pages to remember or reference later, but I never do! I'd like to think they somehow influence me though and I think museums are like that, in the way that you absorb what you see on some level and it will be released as creativity somewhere else! 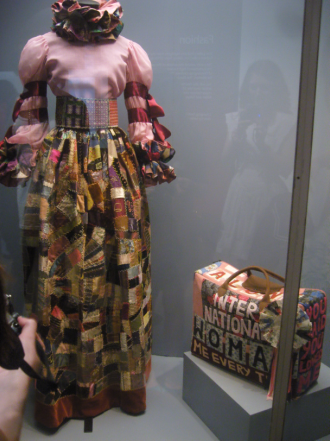 I think the bag was Tracy Emin and contrasted with the antique dress, they make quite a pair! I need some vintage patchwork in my life! Pity summer is almost over as a vintage table cloth dress would be great on a sunny day. 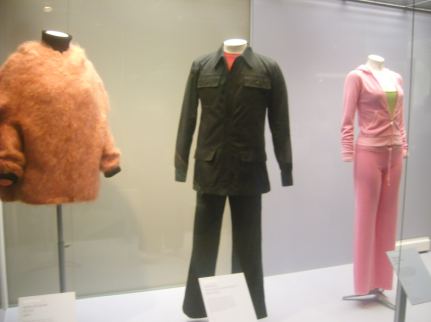 We had a right laugh at this archived velour Juicy Couture tracksuit! Actually Wildfox have some amazing slouchy hoodies but they're too damn expensive! 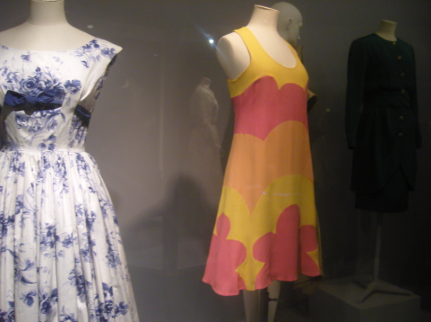 The fashion archives hosted just about the perfect items from each era, but you have to ask yourself if one of your own genuine vintage items could be displayed this way, if you own such things? I have a really, really old heavily beaded cocktail dress I got really cheap on eBay years ago that's probably worth a lot. I posted about it here in 2007 (!!!!!!!)! I just had a look at some old posts and it makes me a little bit sad as I was much happier in myself back then! Or maybe just in different ways. The internet is definitely bad for showing you loads of different looks and people, and it's easy to compare yourself against them. I need to stop looking at American girls on Tumblr and feel content in myself more! People you see online are so far away, you have to create that style and inspiration in your own real life! 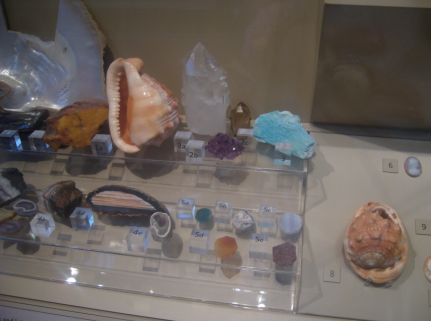 The museum also gave me a few ideas in the accessories department. 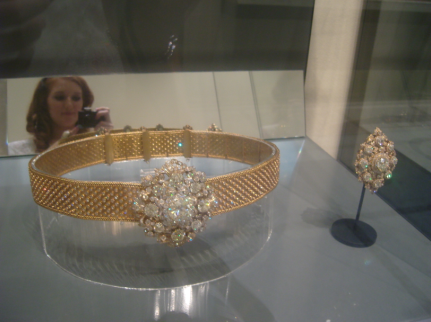 Hugely provocative costume jewellery is really appealing at the moment and I'm seriously lusting after a crystal ring. If I want to graduate uni overdraft-free, I need to stop spending though! 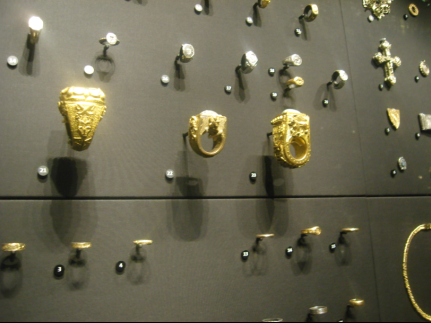 This rings must have been for the fat fingers of huge Kings! Jewellery doesn't have enough pictures on anymore! The most you'll get nowadays really is a cameo. Haha this is the bottom of a dress! I'd SO wear this, seriously without a doubt. 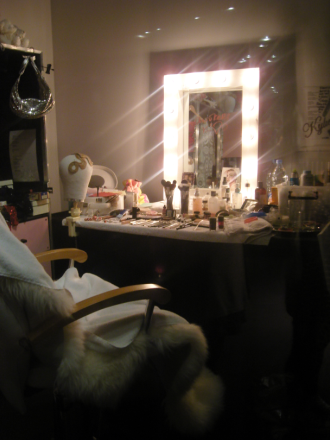 This was one of my favourites pieces, it's an exact replica of Kylie Minogue's dressing room on her Showgirl tour! I didn't get a good picture of the whole thing but it was a room filled to the brim with clothes and gifts, looking messy and thoroughly authentic, like she'd come off-stage into it at any moment! Really wanting some sort of crown!!! 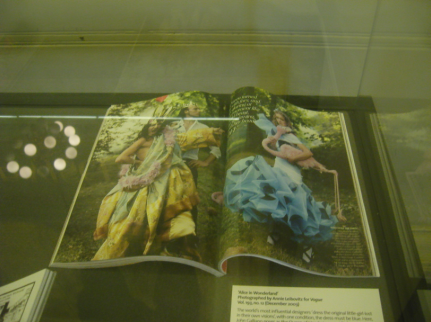 There was a small Alice in Wonderland themed display which included this iconic Vogue shoot. 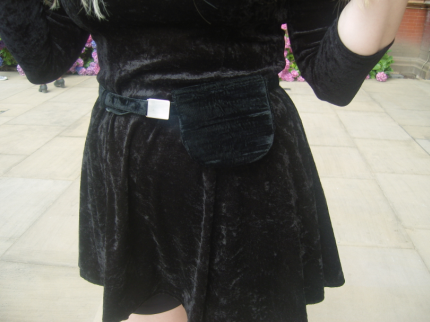 And lastly check out Kylie's belt/bag that matched her dress perfectly! How cool is that?! I have a dress JUST like hers too, I just need to take it up! Maybe we should go around London like twins haha! Bloggers Galore - Part One! Sorry for not being around recently, it hasn't been a very good few weeks and rather than the usual reasons of being busy or tired, I just haven't felt like being enthusiastic about anything. 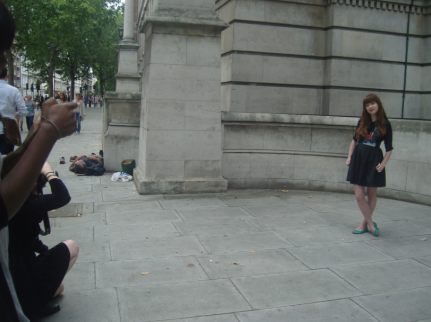 But a total exception to this was a fantastic day in London on Monday for a meet up with some fabulous bloggers! Blog meet ups aren't really about meeting just because you have a website, it's about meeting people with whom you've developed a friendship with online and really want to have a real conversation with! Also you want to have a real impression rather than a 2D image on a screen and a voice rather than a font. I'm sure if you're reading this, you've most likely read the blog of at least one of the lovely ladies at the day and they all have much better photos (see here, here, here and here!). I have no photos of myself on my camera but there are many in their posts, including a fun poke at some classic blogger poses and a jumping gif! It was a cloudy but stuffy day and London is stuffy most of the time so it was hard to know what to wear, but I've found that when going to blog meets it's best not to make any extra effort at all! It might be different if you were going to an organised event where there were people you didn't know but if the blogger you will see is a good online friend and reader, they already know your style! Wear something comfortable and really others are focusing on your personality because they've never seen it before! 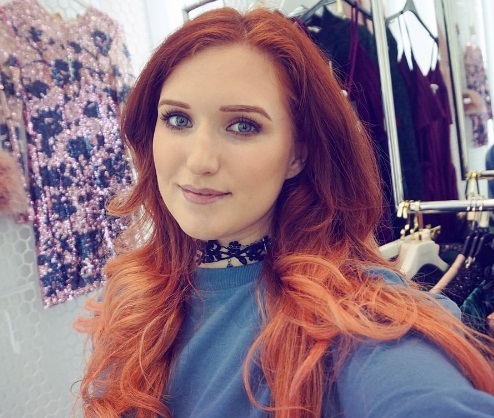 Maybe that's easy for me to say though because all the bloggers I've met looked beauuutiful! 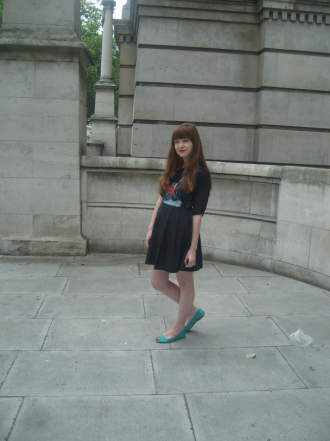 I wore my favourite ever vintage dress which is probably about three years old! I knew I'd be comfortable in it all day and wouldn't need to think about it, but I did have semi-fake tan dramas and wore tights so I wouldn't need to deal! I got the train to London with Winnie of Diamond Canopy as we've met a few times before and we're both Birmingham bloggers! We were chatting all day about the possibility of a Birmingham meet or visit to the Forever 21 opening, which we'll have to discuss more as an open meet is a bit more of a networking, introduction thing. I do read a lot of blogs (subscribed to 328 at this very moment in time!) but there must be a gazillion more out there, and that's not including some that I can't subscribe to on googlereader and have to check when I remember! Anyway, if you've ever had the pleasure of meeting Winnie or can call her a friend then you are very, very lucky because she is the definition of kind-hearted and lovely. She also has one of my favourite blogs. In fact everyone at this meet has one of my favourite blogs! It was a pleasure to travel with Winnie, her style is a great example of being accessible by mere mortals (quite uncommon in the blogosphere!) but she has loads of quirky bits from other countries or unique brands. Meeting people you don't necessarily know in real life means you discuss things rather than just gossip! Soon we were in London and we hopped on the tube to South Kensington and saw Kristabel of I Want You To Know in the station distance. Winnie and I both had met Kristabel before for some cupcake and shopping action and her blog is a really rich read because she has just spent a term interning in New York! I'm so impressed by her knitting skills as that's her degree field and throughout the day she was noting cool fabric patterns and techniques. Kristabel is a pleasure to be with as she's full of chatter and positivity totally radiates from her! Could this be due to her gorgeous skin? Possibly! Getting fabulous glowing skin is my current obsession. The meet came about because infamous Rebecca of The Clothes Horse (omg, I feel like that should be in capitals or something because it's The Clothes Horse!!!) is visiting Europe this summer with her sister and she contacted us about a meet. I've been reading TCH almost from the very beginning and remember when outfit shots were in dorms rather than forests! But what an amazing opportunity to meet a blogger that creates posts that make you go woooow every single day! Unlike many of us, Rebecca goes into detail about her fashion and art loves on her blog but will not natter about random things, so meeting her felt really special because I didn't totally know what to expect! We came out the station and were right away all face to face, which is surreal for a few minutes but soon seems very normal! Rebecca is every bit as sweet, eloquent and warm-hearted as you'd expect from her lovely blog posts, and it was really cool to heard about some of her amazing trips. The American blogging world has evolved in different ways than here in the UK and it was interesting to discuss and debate comments and freebies and endorsements. 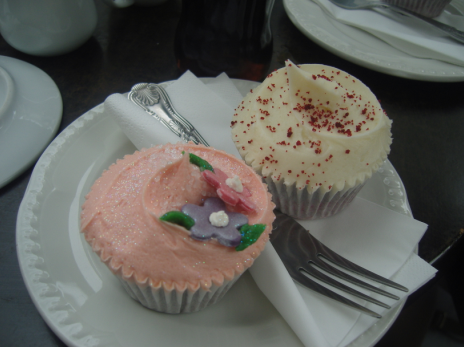 We decided on the Hummingbird Bakery as the perfect place to sample cupcakes and chat, and were very shortly joined by Kylie of Nice and Shiny! 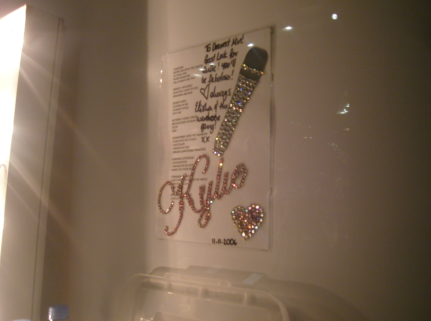 Kylie is in London for some time all the way from Canada to live the London life for a while, how cool is that! We discussed meeting last summer when she first came so when this opportunity arose she had to be there! She's one of my nicest commenters and we have loads of random things in common, like her cool and quirky love of British pop music and my childish love of British pop music! Haha OK we all know Girls Aloud and The Saturdays are the best but she was a fellow teen McFly fan and she has an amazing confidence to pull the fiercest poses and wear the coolest clothes. So pleased we met! She inspires me so much! Hi guys! I'm sorry I haven't posted in a week, there hasn't been a gap like that in a while! I've worked a lot and things have happened every day, and yesterday I just had to go to sleep at 6pm and didn't wake up until 2am! It's been a really weird week and hopefully next will be better as it's my 21st birthday, arghhh. 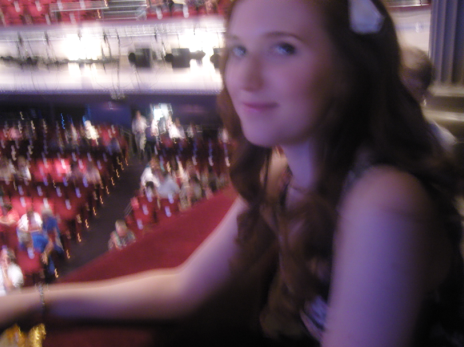 Last Friday my Mom, Chloe and I went to the theatre with my Nan for her birthday to see The Sound of Music, the one where Maria was found on the TV show? I didn't watch it but it was a really great show, especially all the children in sailor outfits! 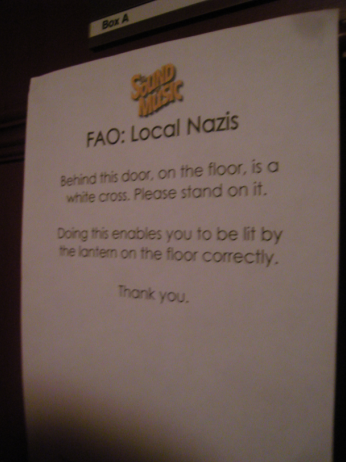 We had a box because my Nan isn't great at sitting for too long and you can't actually see all of the stage too well, but at one point some nazis had to stand in the boxes closest to the stage next to ours just to look a bit scary and set the scene, and when we noticed the dude in the opposite box we had a peek round the wall of ours and there was this huuuge nazi man in full uniform with a gun glaring at us look round! Haha he was so creepy and we were really giggly! These are my nails at the moment, I followed some gradient tutorials on YouTube where you use a makeup sponge, and stuck on some gems I got in Poundland while a clear topcoat was still tacky. If I'm on the cash desk at work loads of people comment on them and I get so distracted explaining how they're done! I'm really wanting a new coat for Autumn and Winter and have been stalking everything camel coloured, but a really nice faux fur coat just came into the store I work at and I might have to buy it! The only problem is that it would have to sit pretty for two months and so many other nice coats could be in shops by then! 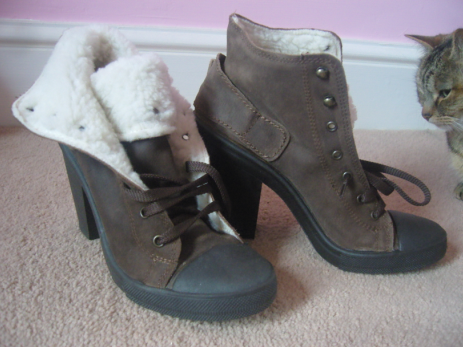 I did buy these River Island boots though because they were in the sale from last season and no one was buying them even though they went down to £15, but they must have been the wisest buy in the shop because shearling will be everywhere in a month and they're brown and sooo comfy! I'll wear these all the time, wearing heels in the day time makes you feel so much more confident I feel. I actually love to dress up when I go to the library, and I mean dress up as in not just go in any old thing and no makeup like you could because it's n0t essential to spend time getting ready to study, but I find if you feel good that day, you get more done and want to spend more time in there! Also my friends and I might just sit ourselves in the science sections because it is a known fact that medics are hot. You can see my cat poking out here! 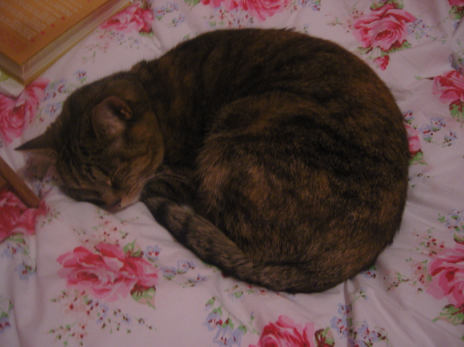 Another reason that I haven't felt like posting towards the end of the week was that when I woke up for a meeting on Thursday morning our neighbour was in our living room because she'd just saw one of our cats had been knocked down by a car. My Mom had brought her in and she was so so perfect apart from one cut on her leg and because I was just getting a cup of tea as I'd just woke up, it was so surreal and just like a dream as that cat was the more lively one and was always nudging you to stroke her and jumping all round my room and now she's not here anymore. 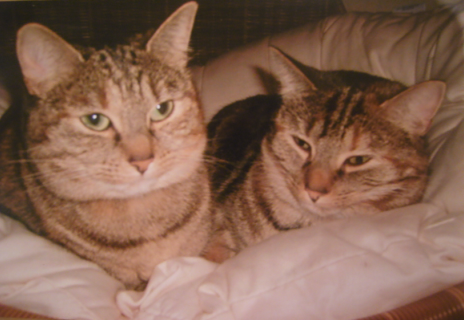 I'm so sad and we are all really upset; our cats were now only three year old sisters and from a sanctuary so she was lucky to have a really lovely life and it breaks my heart that the other cat is now so sad and lonely.